Our lives are stories that require courage to be told. The House My Father Built is one of such stories. The book is a memoir whose humour is at brilliant par with its sarcasm, wit and satire. It is about the author’s fight, through the challenges of being Nigerian and living in Nigeria, to take possession of what is his. 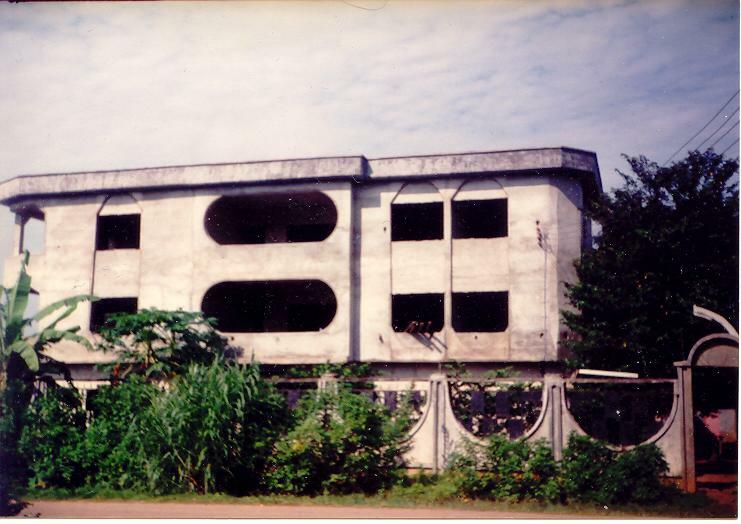 The House My Father Built carefully stings into consciousness memories of Nigeria in the ‘90s. The political, economic and social milieu of that period is brought into sharp focus, and what living through it meant for the average Nigerian is presented from a detached point of view and from the standpoint of having experienced it directly. The House My Father Built tells the story of the author’s father bequeathing a house to him and his siblings, but the author has to wage several battles before he finally wrests control of his inheritance from his father’s tenants. The plot moves from how the tenants of his father tormented and taunted him, defying his rightful authority, on to how he wound up with an unusual acquaintance, a character called Prince, to how he finally discovered the true intents of all the residents of the house his father built. The plot of the book is simple and apparently follows the chronology of the actual events. The House My Father Built is kaleidoscopic. It lays bare for its readers the diversity of experiences characterising landlord-tenant relationships. It ranges over the legal, social and cultural dimensions of the concept of ownership and the primacy of posssession in Nigeria as a society. The Rent Control and Recovery of Residential Premises Edict of Lagos covered the Surulere area where the house in the book is situated. That edict provided for a six-month notice to quit as a necessary requirement in terminating tenancies. After that first notice, another seven-day notice of the owner’s intention to recover possession had to be given the tenant. It is after complying with that procedure that a landlord becomes empowered by the law to institute action against a tenant in court for the recovery of such premises. According to the author, the tenants were put on notice for four years. It would have taken the patience of Job to deal with such recalcitrance. One thing that may have inspired resistance to the author’s authoritarian tendencies, for which there is ample evidence in the book, is the Agbójúlógún concept in Yoruba culture. An agbójúlógún is one who for their livelihood relies solely on their inheritance, and the term is used disapprovingly in whatever context it is employed. The facts of gainful employment and self-sufficiency are usually not allowed to get in the way of stereotyping heirs as idle rent-seekers. The concept seems to inform the mindset of the tenants described in the book and their efforts to ensure that the author’s will is frustrated. There is also the distrust of the author’s skin. As a Nigerian with a white skin, he seems not to have been considered Nigerian enough by the tenants. This and many more sub-themes flow in the undertow of the author’s narrative. The reader is taken in and out of the author’s swirl of experiences. The author weaves a beautiful tapestry of narrative and characterisation. Alhaji is one of the book’s notable characters. He is portrayed by the author as a symbol of Nigerian patriarchy whose ego is not allowed to suffer any blow even if that is required to save his life. The Alhaji is a personality whose whims and interests are more important than the sustenance of healthy relationships. Another character worthy of note is Prince. Described as a funny looking man, Prince seems to complete the puzzle of opportunism in a society like Nigeria. There are several traits of the man that confirm this. Prince’s ability to command respect by instiling a fear of violent reprisal in those who disagree with him, his uncanny swindling abilities and his penchant for loving what he cannot or will not work for, all point to the fact of how much of a predatory society Nigeria has grown to become. The author is tired of a society he is not ready to leave. He wrestles with the egotism that afflicts a typical grown man and with the societal afflictions of Nigeria, like corruption, like abuses of human rights and other maladies. What is unique about The House My Father Built is how the author carefully tells his story without leaving any telltale signs of the buried treasure that the reader eventually unearths upon deep reflection. One of the major preoccupations of The House My Father Built is corruption. The author places corruption at the strategic centre of his work. Every narrative in the book is made interesting or otherwise by the subtle play on the theme of corruption in Nigeria. From the police stations to the courts to the homes, corruption continues to challenge every Nigerian’s sense of worth. Another important theme in the book is human rights. The author shows by how much that which is humane is disdained and how allowing wrongdoing legitimises such behaviour. Police harassment and unwieldy court processes are used to indicate how much value the Nigerian society places on human rights. It is easy to conclude from the book’s narrative that a person’s rights are only upheld until they can be trampled on by the feet of a more powerful person. The book offers firm perspectives for confronting the challenges of Nigerian society, the lack of an enduring committment to the principles and values on which formidable human rights and worth can be established. This is especially important as these problems seem to have grown with the Nigerian entity and brand. The author lets his readers in on his views of some of these issues by jocularly describing the Nigerian democratic transition of 1999 as one soldier handing over to another. While this is literally untrue, its subtlety is instructive, bringing to mind Fela Kuti’s 1989 song, ‘O.D.O.O.’, on how African political leadership is really about transferring political offices back and forth between military men and their stooges. What is further interesting is to question the authority by which a military decree confers legitimacy on a democratic constitution. One may go further to ponder whether the coercive will of the gun may substitute itself for the collective will. It is easy to miss the subliminal messages that accompany the treatment of these themes because of the smoothness of a narrative that is well lubricated by humour and wit. The biblical allusions in some lines in the book and their confluence of thought and humour contribute to its quality as an endearing work of art. Also, the author’s beautiful use of memory and imaginative metaphors are as honey to assist the reader in swallowing the bitter pills prescribed by the book. What the author brilliantly succeeds at is counting the nine fingers of an amputee in their presence without stirring up rancour. What the reader should look out for in The House My Father Built is the anatomy of the Nigerian society. Even though no work of art or product of the mind can be complete, they only have to be compelling, and the book’s achievement is no mean feat. Adewale Maja-Pearce’s spellbinding storytelling, brilliant evocation of life in the ‘90s and addiction-producing use of language will afford stimulating engagement to many readers. The House My Father Built, in spite of an easy narrative and a simple plot, is a serious work of contemplation lovingly wrapped in humour so as to place our problems before us in attractive gift wrappers.